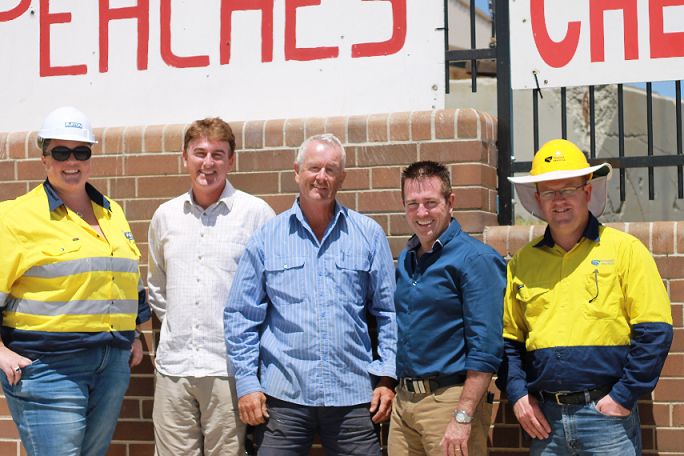 Last Wednesday Member for Bathurst Paul Toole visited the Kelso project for an update and to visit local business Reedy Stone Fruit. Reedy Stone Fruit is on the highway within the project area (just opposite the main site office) and has had extensive property adjustment work carried out while he has been closed for the stone fruit off-season. Reedy Stone Fruit reopened for the stone fruit season this week and Paul Toole MP came to have a look at the work we’ve done up there. The feedback from both Anthony and Mike Reedy as well as from Paul Toole was extremely positive. They were all very impressed with the level of consultation that took place, the work that has been carried out and how much it has improved the look of the property. Anthony Reedy who owns and manages Reedy Stone Fruit was very complimentary of the team that carried out the work but particularly singled out Site Supervisor Justin Wyld, who he said has looked after him and his needs while carrying out the work, and has responded to any request immediately.